Affiliation: Nationwide Children’s Hospital and Myonexus Therapeutics, Inc. I have a Ph.D. in molecular genetics studying neuromuscular development. I then did a post-doctoral fellowship in gene therapy at nationwide children’s hospital with Jerry Mendell as my mentor. I knew I wanted to be a researcher from a young age. I was fascinated by genetics and how defective genes could cause disease. I studied neuromuscular development for my graduate work and I was interested in building on that knowledge to develop treatments for muscle disease. Fortunately, muscular dystrophy research is an area of emphasis at Nationwide Children’s affording me the opportunity to fulfill my goals. I develop gene therapy treatments for Limb Girdle and Duchenne Muscular Dystrophy and translate these treatments to clinical trials. My laboratory also studies the disease mechanisms of Limb Girdle Muscular Dystrophies. Our work is directly applicable to patients. We have ongoing to impending clinical trials for several forms of LGMD (2B, 2D, 2E) and planning clinical studies for other subtypes. We are very optimistic that gene replacement will be a meaningful treatment for MDs. It’s a very exciting time for LGMD research. 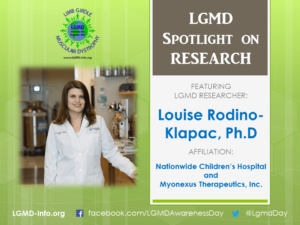 Improvements in genetic testing and successes in gene therapy in other neuromuscular disorders have accelerated research and clinical trials for LGMD. We can rapidly apply what we learn from studying one form of LGMD to another. Patients are my biggest inspiration. It is so rewarding to know that all the hard work we are doing to bring treatments to the clinical will hopefully benefit patients in a very meaningful way! Hearing stories from patients (both stories of hope and challenges) is extremely helpful. It helps us as researchers to know the challenges unique to each specific disease to tailor treatments if possible. Moreover, it is a constant source of motivation to keep working hard knowing there is a huge team of supporters behind you!